Today, we are facing the prospect of the destruction of life as we know it and irreversible damage to our planet due to climate change. Scientists are telling us with ever more urgency that we must act quickly to stop extracting fossil fuels and reduce greenhouse gas emissions. But the world’s largest polluters have prevented progress on bold climate action for far too long. The fossil fuel industry and other transnational corporations that have a vested interest in stopping progress continue to delay, weaken, and block climate policy at every level. 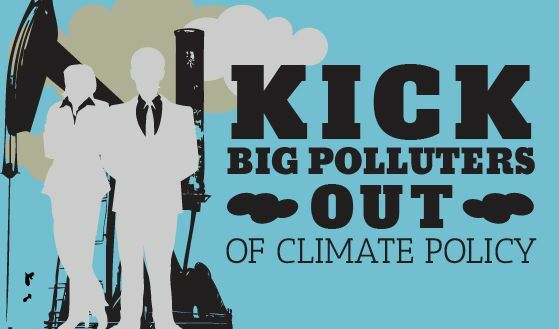 From the World Coal Association hosting a summit on “clean coal” around COP19 to Shell aggressively lobbying in the European Union for weak renewable energy goals while promoting gas, these big polluters are peddling false solutions to protect their profits while driving the climate crisis closer to the brink. We call on the Parties to the UNFCCC to protect the U.N. climate talks and climate policymaking around the world from the influence of big polluters. The world is looking to the next round of negotiations in Paris this December for decisive action on climate. This is a pivotal moment to create real solutions. And the momentum of a growing global movement can secure a strong outcome from the Paris talks and ensure leaders take bolder action to address the climate crisis. A decade ago, the international community took on another behemoth industry — Big Tobacco — and created a precedent-setting treaty mechanism that removed the tobacco industry from public health policy. This can happen again here.